Not to be confused with News Breakfast, the 2008 Australian morning news programme that airs on ABC. Breakfast News was a breakfast news programme which first aired on BBC1 on 2 October 1989. The programme was previously known as Breakfast Time. It was planned to launch on 18 September 1989 but was held back due to technical issues with its new studio. The programme went through three main visual changes. The initial look lasted until 8 April 1993. The 13 April 1993 revamp saw the programme presented from the same set as the One, Six and Nine O'Clock News bulletins. A further and final revamp took place on 2 June 1997 when 'BBC' was shorn from its title, and on-screen it became known as simply Breakfast News. It was during this final period that the tone began to shift, with the return of a sofa set, alongside more features, and more interaction between the presenting team. The final edition of Breakfast News aired on 15 September 2000 and on 2 October 2000 it relaunched as BBC Breakfast. BBC Breakfast News only aired from Mondays to Fridays with no weekend editions compared to their ITV counterparts TV-AM and later GMTV who were on the air seven days a week. However, in September 1991 the BBC launched a short 5 minute weekend breakfast news summary. The Saturday edition aired at 7:25 am to commence their Saturday schedule. The bulletin was not presented from the Breakfast News set, but from the main BBC News set based in the newsroom. The Saturday breakfast bulletin was dropped from the schedules in the autumn of 1999 with the last Saturday morning bulletin airing on Saturday 11 September 1999. BBC Two had already been broadcasting an hour of news from BBC News 24, branded as "Weekend 24" on Saturday mornings from 8 am to 9 am since the early days of BBC News 24 and so the short Saturday breakfast news summary on BBC One started to become redundant. On Sundays the short morning bulletin would air at 9:10 am and this would later be incorporated into the Breakfast with Frost programme which launched in January 1993.
Business Breakfast was a daily news programme which aired between 6 am and 7 am, directly preceding Breakfast News between 4 January 1993 and 2000. Initially the programme aired as part of Breakfast News broadcasting between 6:34 am and 6:55 am. 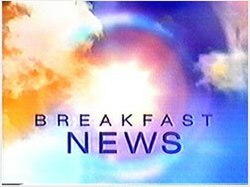 From Tuesday 4 January 2000 until Friday 15 September 2000, Business Breakfast was subsumed into the BBC Breakfast News programme with Breakfast News starting at 6 am each weekday. Business Breakfast remained as a feature not a separate programme however, with business news a key feature in the first hour of the programme. This set up was to change from October 2000 with the launch of BBC Breakfast. Breakfast News Extra launched in early 1996, as an attempt to compete against Lorraine Kelly on GMTV. The programme was presented from the Breakfast News office, on a blue sofa, and hosted by Juliet Morris. It was short-lived, and was axed in the summer of 1997. By this stage the main BBC Breakfast News had undergone a dramatic visual revamp with a new studio set which included sofas alongside the main presentation desk. ^ "BBC - BBC Breakfast celebrates 30 years of waking up the nation - Media centre". bbc.co.uk. ^ "BBC NEWS - Programmes - Breakfast - Presenters - The Evolution of Breakfast". bbc.co.uk. ^ http://www.tv-ark.org.uk/mivana/mediaplayer.php?id=85709d75aeb7887fcb6e8c7ead3a8d5a&media=breakfast_news_postponed_1989&type=mp4 BBC Breakfast Time 1989 Kirsty tells us the new look BBC Breakfast News has had to be postponed. ^ "BBC Breakfast through the years - tvnewsroom". Retrieved 10 December 2018. ^ "TVARK - BBC News - Breakfast News". tv-ark.org.uk. ^ Chris Gaskin. "Breakfast with Frost (TV Series 1993–2005)". IMDb.